The ferocity of the attack meant his skull was driven down into the brain and his dentures were broken. He was found by two young girls in a children's play area and died in hospital. Days later, his alleged attacker, Mohammed Abdul Kadir, had fled the country for Turkey. It is believed he may have travelled to Syria. His accomplice, student Mohammed Hussain Syeedy, was the getaway driver. He did not land the killer blow, but has been convicted of murder after a jury decided he was involved in the plot. So what was the motive for the killing of a man known in his community as a "quiet and dignified" spiritual healer? The answer is religion - and the differing interpretations of a form of spiritual healing that most Muslims regard as acceptable, but others regard as black magic. The concept of "magic" is controversial in Islam. Many believe a form known as taweez, which uses charms and amulets to ward off evil and bring good fortune, is "positive" and provides "a service to the community", says Robert Gleave, professor of Arabic Studies at the University of Exeter. Others regard magic as involving the use of spirits to carry out harmful acts. The court was told that Mr Uddin was known for practising taweez and people in the Rochdale area would come to him for help. According to Arabic studies professor Robert Gleave, people who follow a trend known as Salafism believe that those who prepare a taweez amulet "have committed a sin but someone who continuously practises has moved into the area of unbelief"
However, his spiritual healing methods also came to the attention of Syeedy and Mr Kadir, who the court was told were supporters of IS. The extremist group subscribes to Salafism, a trend in Islam which regards all "magic" as forbidden and believes those who practise it should be punished, often by death. "Practising magic is definitely forbidden in our religion but [hardliners] don't understand taweez, and because they don't understand it, they just automatically assume it's magic and therefore it's haram [forbidden]," says Dr Ather Hussain, an imam based in Leicester. The court was told Syeedy and Mr Kadir developed an intolerance and a "hatred" for Mr Uddin which resulted in the murder plot. The jury heard Syeedy, an engineering student from Rochdale who had worked as a steward at Manchester United games, became aware that imam Mr Uddin was practising taweez in August 2015. Syeedy then agreed to a plan with friends to have Mr Uddin deported. The jury heard the 71-year-old had overstayed his visa and Syeedy was told to "keep an eye" on him. Mr Uddin, who came to the UK from Bangladesh to work as an imam in 2002, had been staying with different members of the community who were happy to support him because of his Koran reader status. The court heard that immigration services told the plotters a photograph and an address were needed before an investigation could take place - and Mr Uddin never lived in one place for long. With the antagonism towards Mr Uddin growing, efforts were made to expose his practices. "We wanted to make the community aware," Syeedy said in court. "That was my main focus." At about this time a friend posted a photo on WhatsApp of Mr Uddin with Rochdale MP Simon Danczuk at the Jalalia Jaame Mosque. An accompanying message - referencing the dark wizard Voldemort in the Harry Potter novels - read: "Oh crap...voldermort nvr gna b busted by immigration now." Syeedy told the court that Mr Kadir, who was aware of the plot to have the imam deported, suggested they follow him to find out where he was living. On the night of the murder they had been driving around Rochdale when they spotted him. The court heard Mr Kadir wanted to get a taweez off Mr Uddin to show the mosque committee so he got out of Syeedy's car. Mr Kadir followed Mr Uddin into the park, returning empty-handed barely 90 seconds later because he had spotted a "few guys", Syeedy explained in court. The prosecution alleges that Syeedy had known full well that Mr Kadir intended to kill or seriously harm Mr Uddin. Prosecutor Paul Greaney QC said: "This was an attack driven by hate and the blow to the mouth was quite possibly the most symbolic of all: 'You will not say anything of which we disapprove'." The court heard that during August and September 2015, Syeedy's WhatsApp group exchanged messages that showed an interest in IS ideology, while a Facebook message from Mr Kadir about taweez prompted someone to reply: "Muhammed said kill the magician." 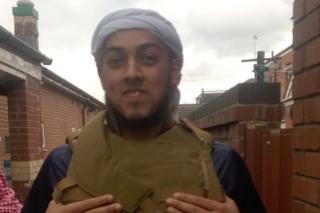 After Syeedy's arrest, police searched his home and found a large volume of IS-related material on his phone, including an image of Syeedy holding a jihadist flag over a road sign in Rochdale, which was altered to read "War Zone Ends". Investigators also found various patches, flags and a headband, all said to have contained jihadist symbols. Syeedy had travelled to Syria in 2013 as part of an aid convoy and the court was told "perhaps" his mindset changed then and he became radicalised. Prof Gleave said punishment for continuous practice of taweez would be execution, adding that IS had been known to behead people considered to have practised magic. Mohammed Ali Amla, who delivers training on tackling radicalisation, has described the case as "quite bizarre", adding that he has "very rarely" heard disagreements over taweez lead to violence. "It's the first time I've known it to happen in this country." Imam Irfan Chishti, from the Rochdale Council of Mosques, said: "To think that [Mr Uddin] was killed, murdered because they felt that this was an obligation religiously is a very, very grave misunderstanding of the faith. "It is unfortunate that nobody was able to get to them at that early stage when they were beginning to question these practices. "Sometime it is as simple as putting in a seed of doubt."